(Newser) – The odds of getting hit by lightning in the US each year: one in 700,000. The odds of Ryan Cross recovering after he was struck in the head over Memorial Day weekend: pretty good, considering. The Idahoan was riding his 4-wheeler with friends in a mountainous region of Idaho City when a storm rolled in, dropping rain and hail. The 34-year-old "leaned up against a tree, was looking at a map on his phone, and that is when it all happened," wife Heather, who wasn't there, tells KTVB. 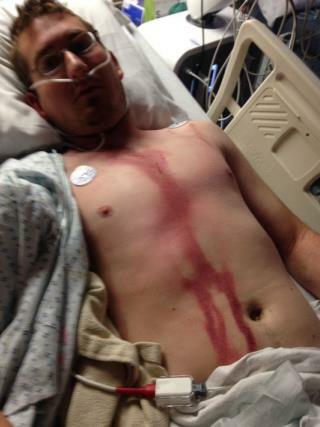 The lightning hit Cross' head before exiting his back, leaving his brain bleeding. One friend still on a 4-wheeler heard ringing in his ears; the other, with one leg on the ground and one on a dirt bike, was hit indirectly and knocked unconscious. He stirred in time to flag down a nearby SUV and the occupants used OnStar to call for help. "That helped save his life," Heather Cross says. Wow! Happy that this guy survived that Bolt! Also.. He should play the Mega Millions lottery now at $233 MILLION!! There ya go ALL!